As Congress and the nation debate health care reform, the impact of immigration policy is an important component of that discussion. This Memorandum provides information about immigration’s effect on the nation’s health care system. The analysis is primarily based on data collected by the U.S. government in March 2008 about insurance coverage in the prior calendar year (2007). The high level of uninsurance among immigrants is partly explained by the large share who have low levels of education. This means they often have jobs that do not provide insurance. Moreover, their lower incomes often make insurance unaffordable. Cultural factors may also contribute to the high rate of immigrant uninsurance. College-educated immigrants are twice as likely as college-educated natives to lack health insurance. In an earlier study, the Center for Immigration Studies estimated that 64 percent of illegal immigrants were uninsured in 2006, accounting for one out of seven people without insurance. If the U.S.-born children (under 18) of illegal immigrants are included, they account for one out of six people without insurance. Among legal immigrants (non-citizens), 27 percent were uninsured in 2006. The data for this analysis come from the March 2008 Current Population Survey (CPS) collected by the Census Bureau. Our estimates for the illegal population come from an earlier CIS study published in 2007 that used data from the March 2007 CPS.1 The March CPS, which is also called the Annual Social and Economic Supplement, is one of the best sources of information on the foreign-born.2 The foreign-born are defined as persons living in the United States who were not U.S. citizens at birth.3 In this report the terms foreign-born and immigrant are used synonymously. The CPS does not include persons in “institutions,” such as prisons and nursing homes. The foreign-born population in the CPS includes naturalized U.S. citizens, legal permanent residents (green card holders), illegal immigrants, and some persons on long-term temporary visas, mainly students and guest workers. All respondents in the CPS are asked if they had any health insurance in the calendar year prior to the survey. Those without insurance for the entire year are considered uninsured. The survey also asks individuals what type of insurance they have. Those with government-provided insurance are not part of the uninsured population. In our 2007 study, we estimated that 64 percent of illegal immigrants were uninsured in 2006. The study also found that illegal immigrants accounted for 15 percent of the nation’s total uninsured population in 2006. Immigrants and their U.S.-born children (under 18) accounted for 8.3 million of the uninsured, or 18 percent of the nation’s total population without health insurance. We also estimated that 27 percent of households headed by illegal immigrants had at least one person on Medicaid, typically a U.S.-born child. Among legal immigrants who are not U.S. citizens, we estimated that 27 percent did not have health insurance in 2006. Lack of health insurance is very common among legal immigrants. This is an indication that legalizing illegal immigrants is unlikely to reduce uninsurance. This is especially true given the low level of educational attainment of many illegal immigrants, which legalization would not change. In our 2007 analysis we estimated that more than half of illegal immigrants had not graduated high school. 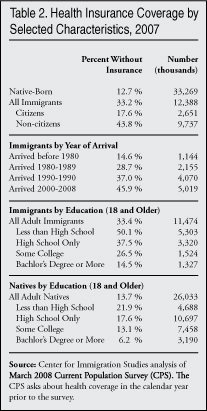 1 Immigrants in the United States 2007: A Profile of America’s Foreign-Born Population. See tables 25 and 26 (pages 36 and 37) at: http://www.cis.org/sites/cis.org/files/articles/2007/back1007.pdf. 2 The survey is considered an accurate source of information on the foreign-born because, unlike the decennial census, each household in the CPS receives an in‑person interview from a Census Bureau employee. It also includes an extra-large sample of minorities. There are a total of 207,000 persons in the survey, 25,000 of whom are foreign-born. The CPS is weighted to reflect the actual size of the total U.S. population. However, it must be remembered that some percentage of the foreign-born (especially illegal aliens) are missed by government surveys of this kind, thus the actual size of this population is almost certainly larger. 3 The foreign-born population in the CPS includes naturalized U.S.-citizens, legal permanent residents (green card holders), illegal immigrants, and some persons on long-term temporary visas, mainly students and guest workers who respond to the survey. It does not include those born abroad of American parents or those born in outlying territories of the United States such as Puerto Rico.